Ellingwood Point is a high mountain summit in the Sangre de Cristo Range of the Rocky Mountains of North America. The 14,048-foot (4,282 m) fourteener is located on the Sierra Blanca Massif, 9.9 miles (16.0 km) north by east (bearing 7°) of the Town of Blanca, Colorado, United States, on the drainage divide separating in Rio Grande National Forest and Alamosa County from San Isabel National Forest and Huerfano County. 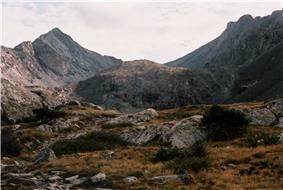 Ellingwood Point was named in honor of Albert Russell Ellingwood, an early pioneer of mountain climbing in the Western United States and in Colorado in particular. Ellingwood Point only barely qualifies as an independent peak under the 300-foot (91 m) topographic prominence cutoff which is standard in Colorado. It is also quite close to its parent peak, Blanca Peak. Hence its inclusion in fourteener lists has been somewhat controversial. However most authorities do consider it a true fourteener. ^ a b The elevation of Ellingwood Point includes an adjustment of +1.789 m (+5.87 ft) from NGVD 29 to NAVD 88. ^ a b c d e f "Ellingwood Point, Colorado". Peakbagger.com. Retrieved October 20, 2014. ^ a b c d e "Ellingwood Point". ^ Louis W. Dawson II (1996). Dawson's Guide to Colorado's Fourteeners, Volume 2. Blue Clover Press. 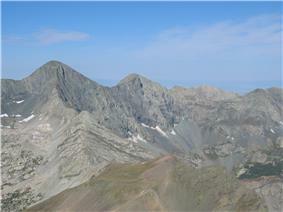 "Blanca Peak and Ellingwood Point". 14ers.com. Retrieved 2011-05-15. "Ellingwood Point". SummitPost.org. Retrieved 2011-05-15.